CHICAGO — Carter Hart continues to turn back the clock. Just last month, the Flyers’ rookie netminder matched Jocelyn Thibault’s rookie record with eight straight victories before the age of 21, a record established back in 1995. Thursday against the Blackhawks, Hart may have done himself one better. 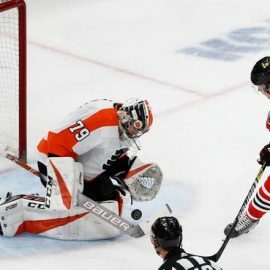 Hart’s 40-save performance in a 3-1 win at the United Center was another gem in his rookie season and marked the first time in 32 years that a rookie goaltender had three winning performances of making 40 saves or more while allowing one goal or less. Boston’s Bill Ranford was the last goalie to do that prior to Hart Thursday night. Hart is also 7-0 during games in which he’s been forced to make 37 or more saves, and certainly the volume of shots Hart has been subjected to is an element general manager Chuck Fletcher and the Flyers will want to address in the offseason. However, the Chicago Blackhawks didn’t want to give Hart too much credit for the victory. Since losing three straight games, and getting pulled in the first period in two of the losses, Hart has regained his composure and appears to be locked in with a .966 save percentage over his last three starts. Moreover, it shows the maturity and intelligence of a young player in a position that can be quite demanding. Right now, Hart is merely rewriting the past. Professional hockey agency that has been helping clients achieve their pro potential since 2001. With a successful and high profile career comes the added pressure to perform consistently in the necessary daily tasks as well. that the details of their life on and off the playing field, as well as their financial future are secure. © 2019 Roy Sports Group.